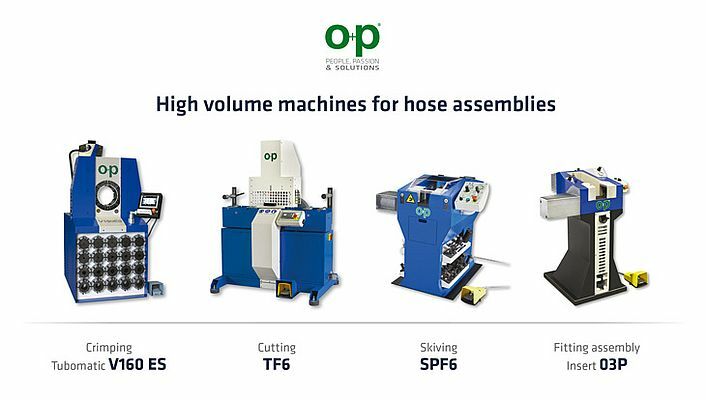 With more than thirty years of experience within the hose and tube processing equipment industry, OP is pleased to offer to their customers a complete range of products particularly suitable for the high volume production of hose assemblies: the crimping machine V160ES, the cutting machine TF6, the skiving machine SPF6 and the preassembling machine Insert 03P. The grease-free crimping head is particularly narrow to crimp big hose ends even with large flanges. The machine is provided with silent pump, back limit switch and ES4 electronic control system with touch screen: many options are available on request such as the pressure control system, the speed control system, the kit transfer data, the electric pedal, the marking dies, the barcode, camera and light. TF6 is provided with a 11 kW self-braking motor (but it can also be supplied without), electric control by pedal, fume extractor connection, drawer for internal cleaning and self-centering system allowing the proper positioning of the hose during the cutting process. The machine is controlled by a PLC with 7” colour touch screen that gives the opportunity to create and save recipes, setting the hose diameter . This is the key feature allowing the saw to function in a fast forward phase and a slow cutting phase, depending on the hose being cut. The saws ability to select the optimal cutting speed saves both production time and blade life. The software already includes the stroke counter. 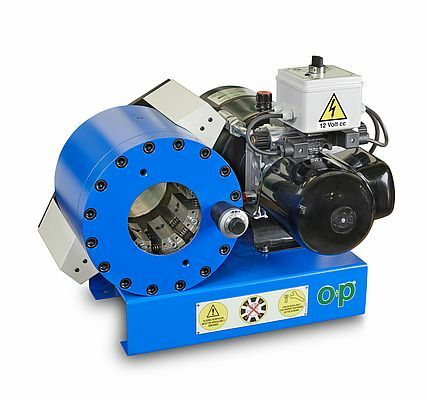 The SPF6 is a skiving machine capable of simultaneously or separately skiving the interior and exterior surface of hydraulic hoses up to 3” as well as obtaining a perfect preassembly of the fittings thanks to the insertion function. The machine is provided with a device for centring the return stroke of the piston which allows accelerating the skiving and insertion function and with a safety device which prevents the operation of the machine when the safety casing is open. INSERT 03P has been designed to pre-assemble straight and curved fittings on hoses before crimping: this operation must be done carefully , making sure that the fitting is well positioned in order to avoid any rupture. Thanks to the ease of use, it works pneumatically, it allows to adjust the self-centering vice locking pressure – so the fitting is perfectly positioned on the hose – and to choose different stroke regulations. The crimping and the cutting machines can be supplied in the required special voltage.